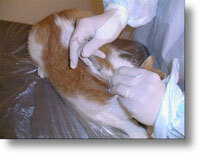 Inject radioactive iodine under the skin to destroy the abnormal tissue and leave the normal thyroid tissue intact. 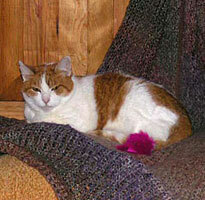 Medicating Glory would control her hyperthyroidism but would not cure it. Plus, pilling her daily and having periodic blood work done to monitor her progress would be the most expensive long-term treatment. Surgery involved risks of anesthesia and possible complications including: low blood calcium, nerve damage, and voice changes. Treating Glory with radioactive iodine was the most desired treatment because it was the least stressful and ultimately less expensive than administering daily medication for the rest of her life. 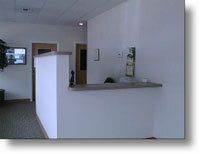 Below are photos and descriptions of Glory's treatment experience at the Feline Hyperthyroid Treatment Center in Tacoma. 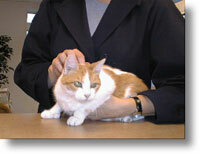 Glory was diagnosed with hyperthyroidism. After discussing the treatment options with Glory's regular vet, a consultation appointment was scheduled with Dr. Wackerbarth at the Feline Hyperthyroid Treatment Center in Tacoma. Glory got up the morning of her appointment, had breakfast, and arrived at the Feline Hyperthyroid Treatment Center in Tacoma. 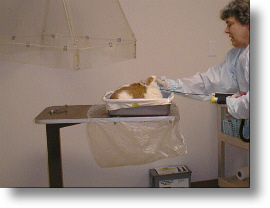 After being examined by Dr. Wackerbarth, Glory was admitted and her prescribed dose was ordered from the pharmacy. Her dose arrived along with those for the other cats admitted . 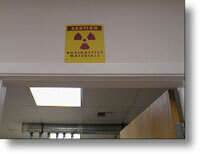 The radioactive iodine was delivered in a syringe, and the injection was given just under the skin, similar to a vaccine. After that, Glory was given dinner, then it was time for lights out. 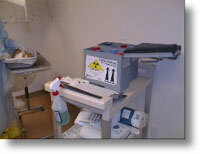 The following morning, Glory and the other cats being treated were measured with a Geiger counter. The state requires that all cats must remain hospitalized until the amount of radiation they are giving off falls below the mandated level. When measured, Glory was below the state mandated level and arrangements were made for Glory to be discharged that evening. Glory's foster mom arrived and took Glory home. Glory had no activity restrictions, and follow-up appointments were scheduled with her regular vet after her treatment. 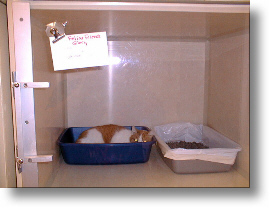 While she was in the hospital, Glory was served dinner and breakfast, and had her litter box scooped twice. She did not vomit or have diarrhea. 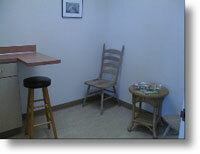 She was not sedated at any time, though if she had shown signs of stress, she could have received a mild tranquilizer. This was not needed. 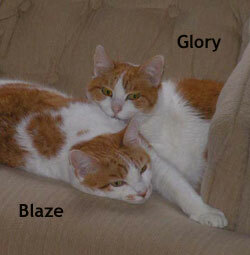 THANKS TO RADIOACTIVE IODINE TREATMENT, GLORY LIVED 5 MORE HAPPY AND COMFORTABLE YEARS IN A HOME WITH HER SON, BLAZE. Feline Friends wants to say a special THANK YOU to Feline Hyperthyroid Treatment Center for the excellent care they took of Glory. For more information click on their Logo below.